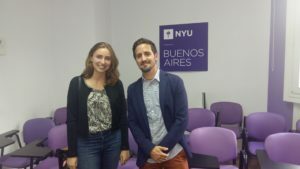 Nicole, who is Argentine- American, studied Social Research and Public Policy in NYU Abu Dhabi and currently works at Novetta Solutions, a security analysis company, as a Strategic Media Analyst. Since the class was discussing topics related to her professional experience, she agreed to join them. The session explored the different processes of regionalization and internationalization in Latin America. Further, because one of the main dimensions of these processes revolves around the security variables in the region’s link with the United States, her experience in security analysis contributed greatly to the students’ understanding of this complex subject. Nicole shared her perspectives on the topic, and explained how her work analyzing news of conflict issues and reporting the information to different clients influences decision-making both in the private sector and in government. After listening to Nicole, students shared their thoughts on the matter, asked questions, and participated in a lively discussion.